A delicate matter at times. Of course any lutemaker will accept instruments of his own making for repairs - after all he knows how everything has been done. 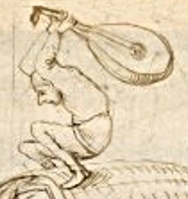 But with instruments made by other luthiers, not knowing which techniques have been employed, one may face difficulties that can make you quite desperate. Mostly it's modern glue or unhistorical timber joints that cause problems, but by the time you notice these, the instrument often is in a condition where the working process cannot be reversed any more nor the lute be returned to the owner. 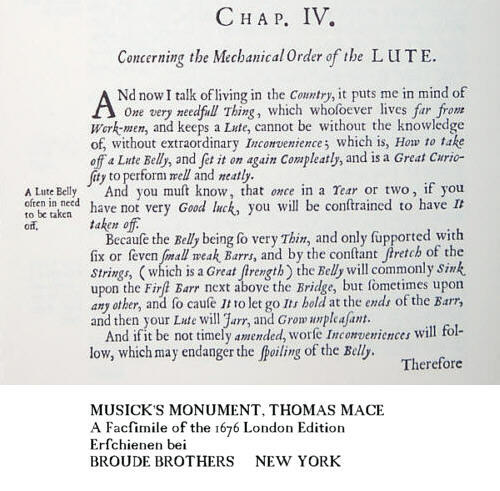 Then you just have to go on and hope that the customer is familiar with Thomas Mace's book "MUSICK'S MONUMENT", where he may have learned that only with a lot of luck a lute need not be opened for repair more than once in a year or two, and how to mend it with assistance from the village's carpenter. Considering the time a lute like the famous Hans Frei was actually used in, undergoing numerous changes and adaptions to new epoques' requirements, one can imagine quite an amount of repairs. You might wonder why zip fasteners had not been invented back then. A different focus and tolerance concerning traces of working procedures, aging and repairs may be a hint towards possible answers. Artisans did not have to compete with the cool precision of computer-controlled production, manual labour did not have to justify itself and its inherent humane imperfection. But however - if you visit a museum with eyes open, in every field of the crafts you'll see things that in today's views seem hard to accept. This does not imply craftsmen of the past worked better or worse than their counterparts of our day - the way of looking at things was different. I personally prefer the jagged traces of frame saws on the back of baroque furniture to todays cardboard with imprinted decoration concealing everything. I don't want to argue for bad, negligent work. The decision, whether you allow traces of working processes to show or try to comply with the modern aesthetics of precision always is a tightrope walk. The question is one of accepting a different view on perfection as a stylistic device in your work. We all try to have authenticity in our work, you as a musician, me as a maker of instruments. Maybe all of us could benefit from a certain amount of laissez-faire. At any rate I am always happy when a major repair has been accomplished, the structure of the instrument is restored, the action is comfortable for the player, no annoying noises are produced and it can be played again. Working carefully on the basis of ones experience can help to minimise visible traces of repairs, but in the end they will always be detectable. Of course you can ask for a repair of any plucked instrument. We'll take a look at it together and decide how to proceed. Prices for repairs cannot be given here - all cases are different and in the end a lot depends on whether it is just the function of an instrument that should be restored or whether nothing should be visible of the mending afterwards.